I'm thankful to Jo-Anna from A Pretty Life for inviting me to participate in my very first Blog Hop! 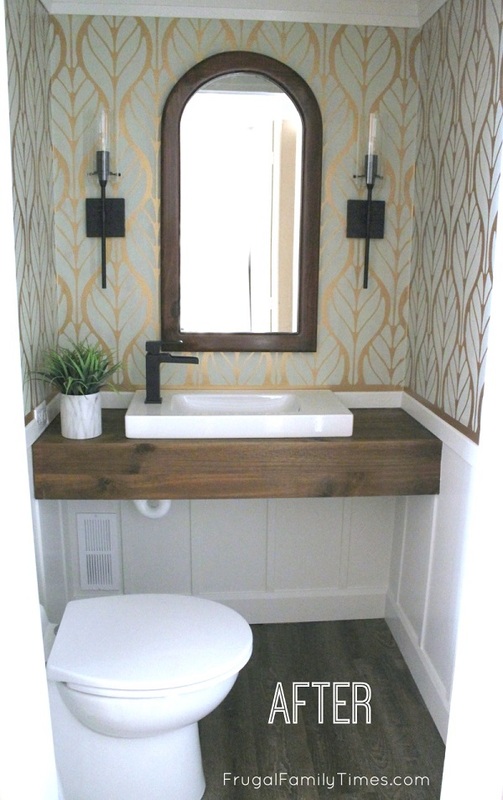 This one is so much fun. 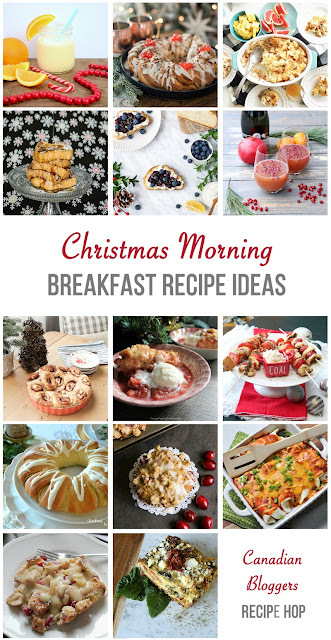 When you get to the bottom of this post you'll find links to all the bloggers sharing their great ideas for special Christmas Morning Breakfasts. I can't wait for you to see what my fellow Canadian bloggers are sharing. They're such a talented group! I've made this Cranberry Apple Cobbler for many many years. It's become one of my signature dishes to take to potlucks during the holidays. 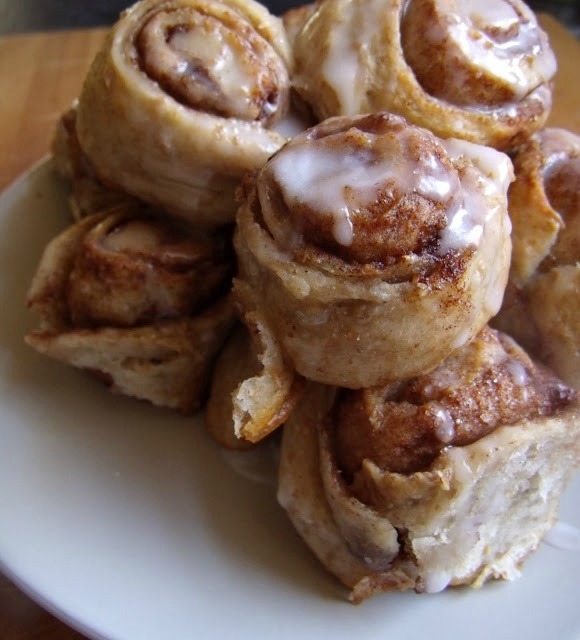 I always bring copies of the recipe along - people always ask how to make this themselves. It's that good. This cobbler doubles nicely for big gatherings. BUT! Don't double the topping - the dumplings will not cook properly! (I learned the hard way - so you don't have to.) Just double the fruit mixture. Part of the joy of this recipe is the smell. It smells exactly like Christmas. 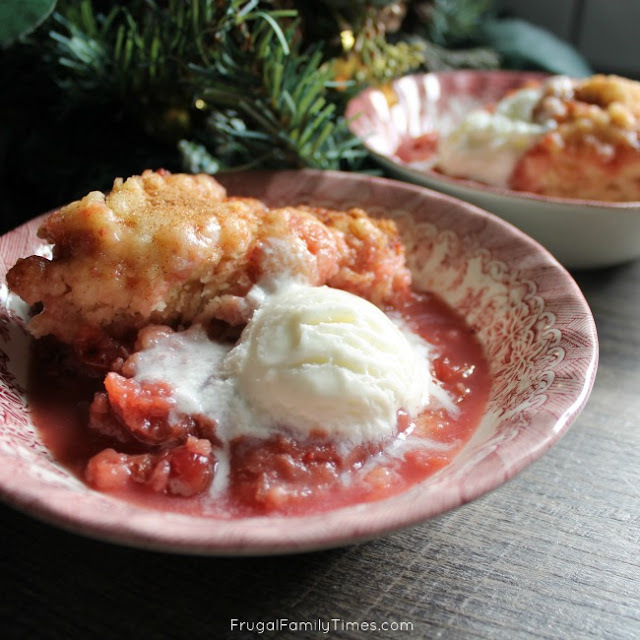 This will be my first time making this Cranberry Apple Slow Cooker Cobbler for breakfast - and I can't wait to wake up Christmas morning to the aroma. I plan to prep it all Christmas eve - except for the dumplings. I'm going to set the timer on my Instant Pot to start at 3 am for 4 hours on high. If you don't have a timer on your slow cooker - just set it on low for 8 hours when you finally head to bed - after all the last minute wrapping! When we're up in the morning I'll whip up the dumplings and plop them on top. 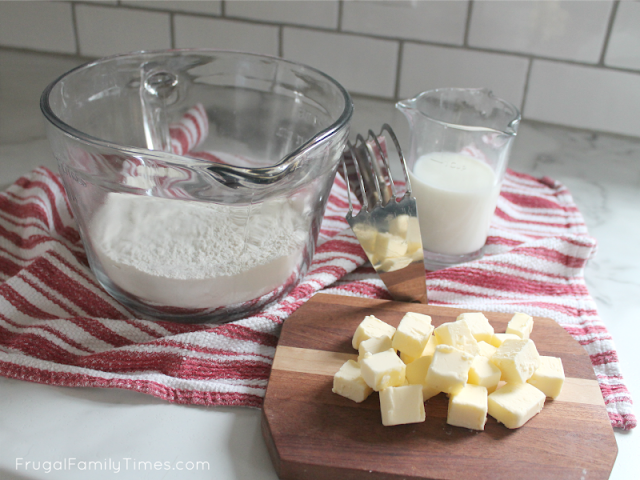 Christmas Eve day I'm going to measure out the dry ingredients in my lidded batter bowl and cube the butter. Then it will take only a couple of minutes in the morning. Christmas morning minutes are too precious to spend in the kitchen! He's going to prep them the day before and pop them in the oven when we wake up. As this cobbler simmers your home will smell just like Christmas! This cobbler is lovely served warm with a big dollop of vanilla frozen yogurt or ice cream. Place cranberries in the bottom of the slow cooker. Add sugar, cornstarch and cinnamon, tossing to coat. 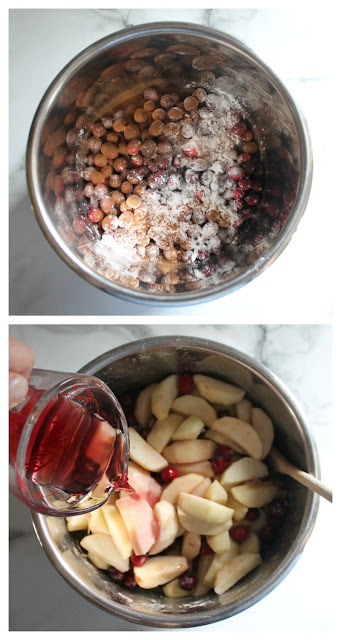 Add cranberry juice and apples; stir to combine. Cover and cook on LOW for 6 to 8 hours (or on HIGH for 3 to 4 hours). Ahead of time: in a bowl combine flour, sugar, baking powder and salt. Set aside until cook time is done. With a pastry blender cut in cold butter until mixture resembles coarse crumbs. Drizzle with milk and stir with a fork until a thick batter is formed. Drop batter by spoonfuls over the fruit mixture. Cover and cook on HIGH for 30 to 45 minutes (or until a toothpick inserted into the centre of the dumplings comes out clean). In another bowl mix sugar and cinnamon. Sprinkle over the dumplings before serving. This cobbler doubles nicely for big gatherings. BUT Don't double the topping - the dumplings will not cook properly! (I learned the hard way - so you don't have to.) Just double the fruit mixture. Have fun visiting these fabulous bloggers to help you choose your special breakfast! This looks like a perfect Christmas morning dish...cranberries and apples are a match made in heaven! Thank you for joining us Robin! Merry Christmas! i definitely want to try this recipe, I have never had cobbler before! Cranberries and apples?! Oh my! I'm sure it smells just like Christmas! And the slow cooker - brilliant! This sounds delicious!! And I second Krista- what a great idea to make it in the slow cooker. Hey Robin can i make this recipe for 12 people? if yes then what is the INGREDIENTS?